The month of July has traditionally been consecrated and devoted to the Precious Blood of Jesus. To learn the telos (the ends) of the Mass would be a great resolution for this month. To reveal those goals, I want to show the prayer that every priest (before Vatican II) would pray before the Mass. It’s in Latin, traditionally, but with the English there, too. I give here my translation a bit more word-for-word: I will to celebrate Mass and to confect the body and blood of Our Lord Jesus Christ, according to the rite of the Holy Roman Church, unto the praise of the omnipotent God and all the Triumphant Church, for my good and the good of the entire Church Militant, for all who have commended themselves to my prayers—in general and specifically, and for the happy state of the Holy Roman Church. May the omnipotent and merciful Lord grant us joy with peace, amendment of life, space for true repentance, consolation of the Holy Spirit and perseverance in good works. Jesus offers Himself in the re-presented sacrifice of Calvary in the Mass. The prayer tells us, in order of importance, the telos of the Mass, taking the italics below from the prayer above. 1) The Blessed Trinity: Unto the praise of the omnipotent God. 2) The priest: For my good. 3.) All the Saints: All of the Triumphant Church. 4) All the Catholics on earth: The good of the entire Church Militant. 5) Those who have generally given themselves to the prayers of the priest: For all who have commended themselves to my prayers—in general. 6) Those who have commended themselves specifically to that priest’s prayers at Mass: For all who have commended themselves to my prayers…specifically. 7) For the happy state of the Holy Roman Church. I have done this prayer almost every day of my entire priesthood before Mass. It makes me think about why I’m doing it. Jesus offers Himself first in an act of infinite love to the Blessed Trinity, even if the priest has no altar server. That means that the priest offering Mass brings infinite value to the world when he offers Mass—alone or with thousands in attendance. Another reason to ignore numbers is because the Mass has billions of angels in attendance, anyway. One should really have a holy fear of God when you consider that at consecration even Mary adores, from the highest point in heaven. When Church authorities put Padre Pio under interdict for ten years, prohibiting him from offering anything but a private Mass, was Padre Pio’s Mass of any less value during those ten years? It is this author’s personal but unproven opinion that Padre Pio and His Mass deferred the wrath of God from ending the world during two World Wars. Mary told the children of Fatima, after the main apparitions, that souls fall into hell “like snowflakes” every day. 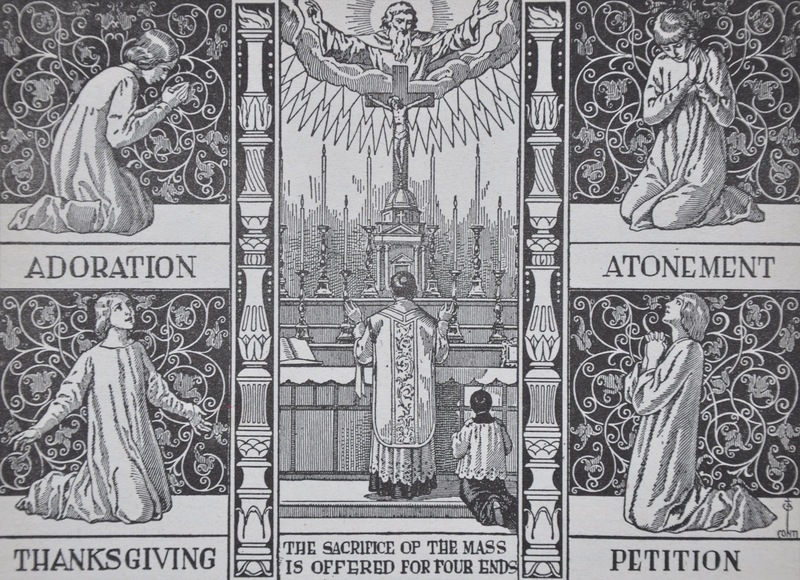 Thus, we can not hope that “all men be saved.” The Mass is offered for the salvation of the world—whether or not physical people be in attendance or not. Giving glory to God and the salvation of souls is the telos of the Church, whether or not anyone show up. This is the theology that will determine if Mass be worship or entertainment. This is the theology that informs every vocation: that we must strive to please God, and not men.